Home / Entertainment News / DRAMA as a woman urinates inside a bank in South Africa after she was kept waiting and the toilets were locked(VIDEO). DRAMA as a woman urinates inside a bank in South Africa after she was kept waiting and the toilets were locked(VIDEO). 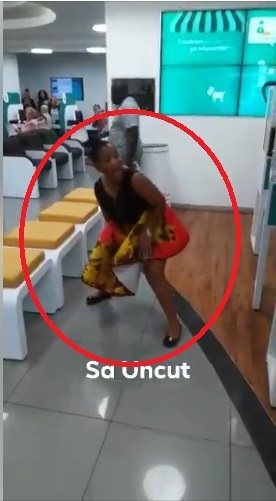 Thursday, April 4, 2019-This woman caused drama after she urinated inside a bank in South Africa. According to reports, the lady drove to Standard Bank where she is a customer and after being kept waiting for almost half an hour, she complained that she was pressed and wanted to go to the toilet. The management told her that the toilets were locked and guess what, she urinated inside the bank.